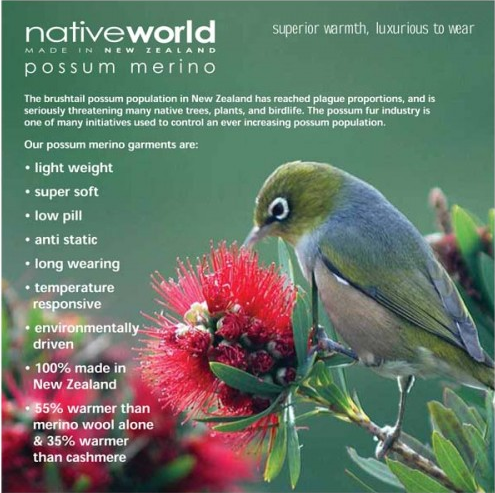 Kiwi Country Clothing are the sole suppliers of Possum Merino in Ireland. Our possum/merino fibre is 55% warmer than merino and 35% warmer than cashmere.The hollow possum fibre traps air and acts as an extra insulation layer to give superior warmth. It is a very durable, high performance product that will look good in years to come. Our garments are developed with comfort in mind. The softness of the possum and merino means they are gentle against the skin and hypo-allergenic. The high “wickability” of the possum/merino means that moisture is moved away from the skin to the surface of the fabric, keeping you warm in the cold and cool in the summer... thus possum/merino can be worn all year round. Properly cared for it will look as good in years to come as it does when new. And here at Kiwi Country Clothing we can show you living proof of 10-15 year old garments which show very little proof of wear. MKM (Manawatu Knitting Mills) has been in business in New Zealand since 1884, and are regarded as the premium manufacturer of possum/merino in NZ... which is why we chose them as our preferred supplier! I have been wearing their range since first going to NZ in 1998, and all of my original pieces still look fantastic. In 1905 they made the very first “originals” All Black jerseys for the victorious tour of Great Britain. Today, we carry a full range of gear that is strong, reliable, and designed for every day in the city as well as for the toughest days out in the elements. Did you know? Possum merino requires alot less washing... does not exude body odours (as the possum fur neutralises sweaty smells) and socks can last in shoes and boots for two weeks or more, and still smell good! Honestly.